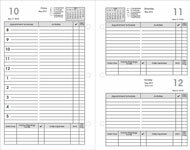 exa Preference Collection Planner Refills2020, Sun Graphix Organizer Inserts. 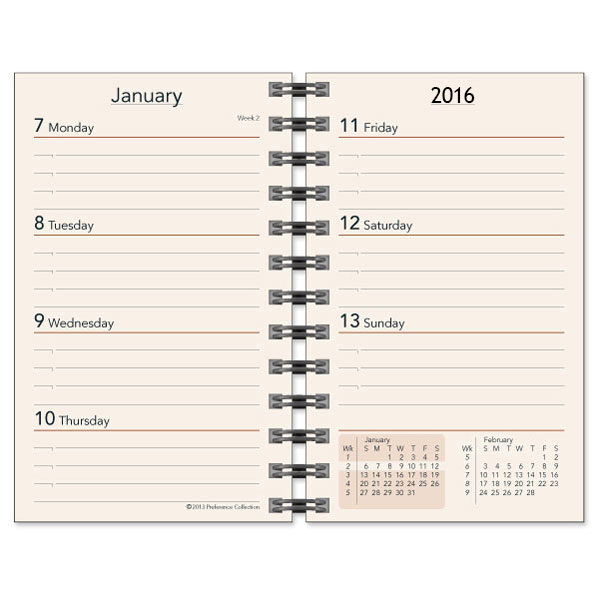 Wirebound and loose leaf calendar refills offered in a variety of sizes to renew your planners and organizers. 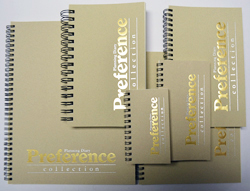 Preference Collection Agenda refills are offered in the most popular sizes and will fit most major brand binders, organizers and planners. 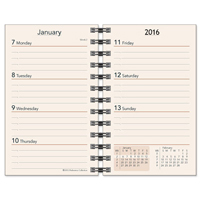 Keep your appointments, events and schedule organized with one of our weekly, monthly calendar refills inserts. Purchase your item on the Internet, or place an order by, Phone, Fax or E-mail (only by Credit Card Payment). You may order by Mail - send order info (along with the Year you'd like) with a Check or Money Order to the address provided: (Refill Services, 16 Winkler Rd, Sidney, NY 13838). 4 5/16" x 2 13/16", 6" x 3 1/8" & 7 3/4" x 5 1/2"
Looking for a white refill? Preference Collection has discontinued the white option, but we do have white substitutes that would work. 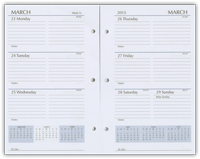 We understand that off-white/ivory paper does not always harmonize with cover colors like black, blue, green and red, so our Refill Services planners offer an inexpensive white alternative. Available in most of the Preference Collection sizes for 2019 & 2020. For 2019/2020: Ivory Paper, 3 hole or standard 7 hole spacing/drilling. 144 pages. Some 7-hole 2019/2020 refills still available, in white, only. White paper refills. 128 pages; Weekly View Format. Also includes a 3 Yearly View, 12 Monthly View, 52 Weekly View. And includes Advance Planning, Important Dates, International Holidays, Birthdays and Anniversaries, Weights and Measures, Weather, Interest Rates, Road and Air Miles...and more! 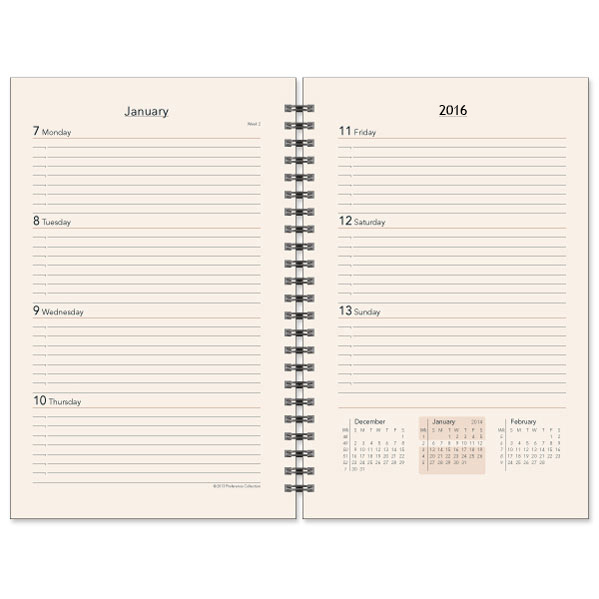 Calendar refill only and no address sheets. White paper refills. 128 pages; Weekly View Format. Also includes a 3 Yearly View, 12 Monthly View, 52 Weekly View. And includes Advance Planning, Important Dates, International Holidays, Birthdays and Anniversaries, Weights and Measures, Weather, Interest Rates, Road and Air Miles...and more! 26 address sheets included. Durable leatherette tabs. One set of A-Z index 13 division tabs. White paper. 6 hole. 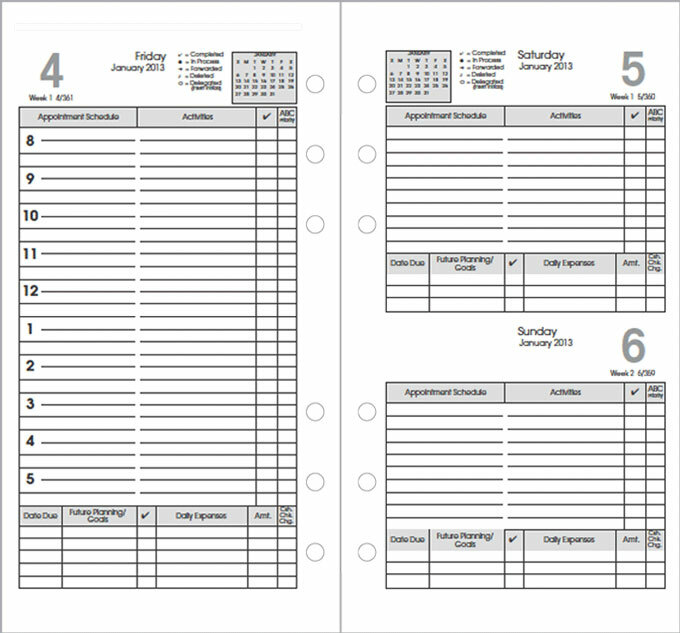 Weekly and Monthly View Format. 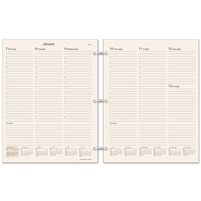 One planner; with two formats. Also includes Area Codes and Time Zone Map, Important Dates, International Holidays, and Toll-Free Numbers and Web Sites! 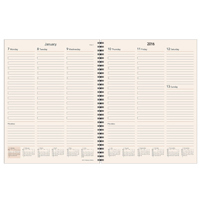 Calendar refill only and no 48 sheet supplemental section. White paper. 6 hole. 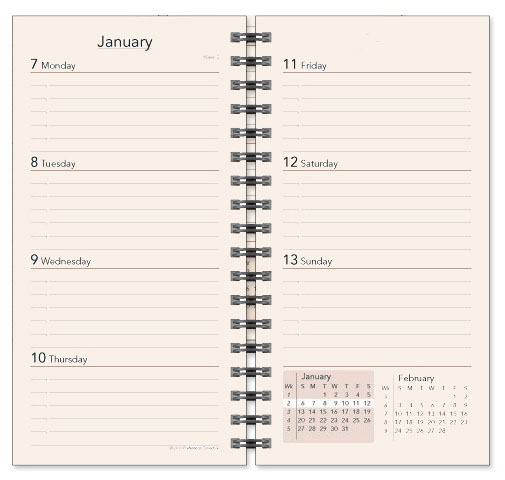 Weekly and Monthly View Format. 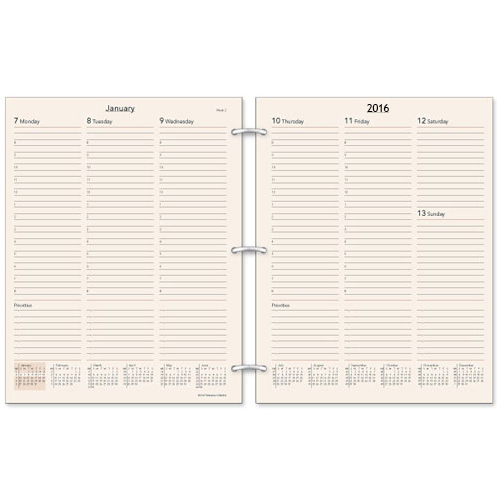 One planner; with two formats. Also includes Area Codes and Time Zone Map, Important Dates, International Holidays, and Toll-Free Numbers and Web Sites! 48 sheets (96 pages) supplemental section included. The supplemental section has 20 ruled, 24 to-do and 54 address pages. One set of A-Z index 13 division tabs. One set of 3 division top tabs. One set of 12 division monthly tabs. 46 sheets (96 pages). 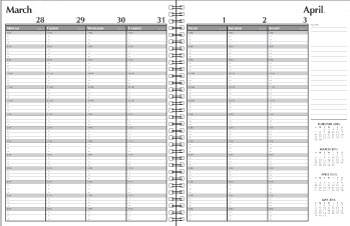 The supplemental has 20 ruled, 24 to-do and 54 address pages. Page marker to save your spot. 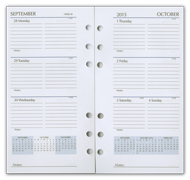 Page protector is clear vinyl material with durable center ridges for flap to bend around and protect pages. Choice of White or Ivory paper. 6 hole. Daily View Format. Also includes Advance Planning, Personal Information, 3 Yearly View, Important Dates, International Dialing, USA Area Codes and Time Zones Map. Choice of White or Ivory paper. 3 hole. Daily View Format. Also includes Advance Planning, Personal Information, 3 Yearly View, Important Dates, International Dialing, USA Area Codes and Time Zones Map. Choice of White or Ivory paper. 7 hole. Daily View Format. Also includes Advance Planning, Personal Information, 3 Yearly View, Important Dates, International Dialing, USA Area Codes and Time Zones Map. White paper. 3 or 7 hole. 144 pages. 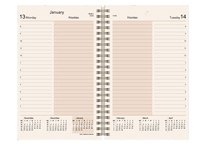 Weekly and Monthly View Format. 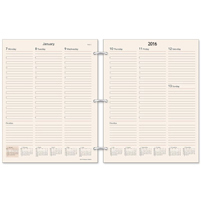 One planner; with two formats. Also includes 3 Yearly View, 12 Monthly View, 52 Weekly View. And includes Advance Planning, Important Dates, International Holidays, Birthdays and Anniversaries, Weights and Measures, Weather, Interest Rates, Road and Air Miles...and more! 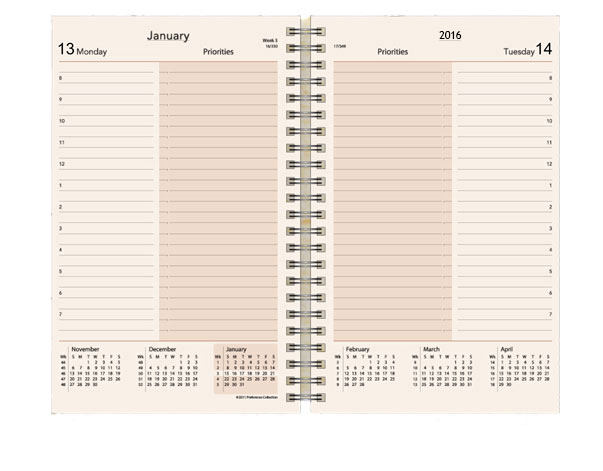 2019/2020 Calendar refill only and no 48 sheet supplemental section. White paper. 3 or 7 hole. 144 pages plus 96 page supplemental. 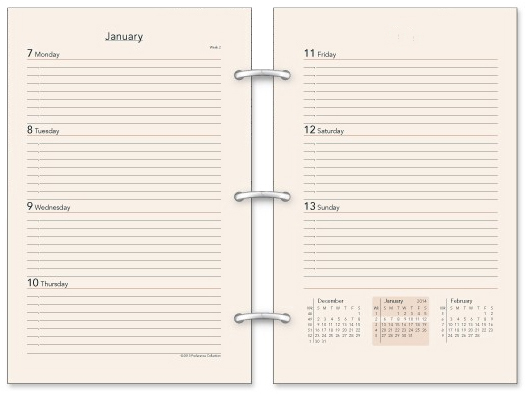 Weekly and Monthly View Format. 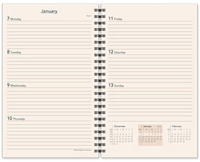 One planner; with two formats. Also includes 3 Yearly View, 12 Monthly View, 52 Weekly View. And includes Advance Planning, Important Dates, International Holidays, Birthdays and Anniversaries, Weights and Measures, Weather, Interest Rates, Road and Air Miles...and more! 48 sheets (96 pages) supplemental section included. The supplemental section has 20 ruled, 24 to-do and 54 address pages. Page marker to keep your current location marked. Week-at-a-View Format. 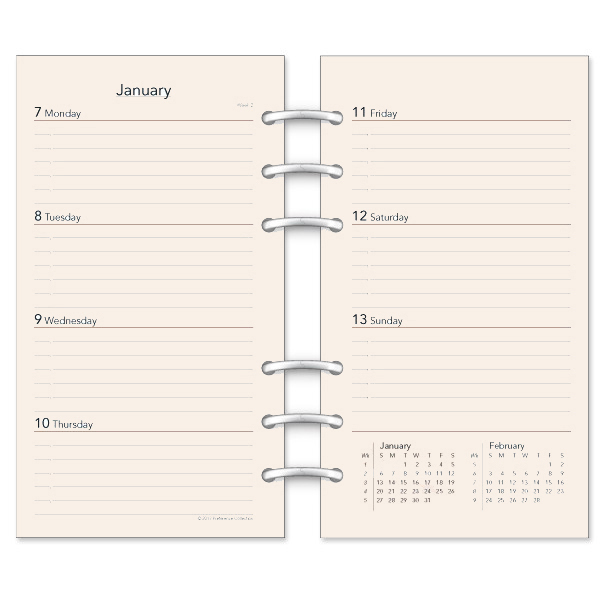 Other features include 3 Year-at-a-View, 12 Month-at-a-view, 52 Week-at-a-View, PLUS: Advance Planning, Important Dates, Weights & Measures, International Holidays, Birthdays/Anniversaries, and more! Week-at-a-View and Month-at-a-view Formats. 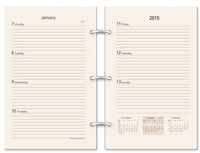 One planner, two formats in the same system. 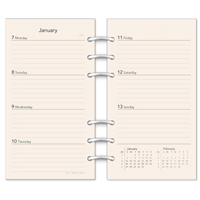 Other features include 3 Year-at-a-View, 12 Month-at-a-view, 52+ Week-at-a-View, PLUS: Advance Planning, Important Dates, Weights & Measures, International Holidays, Birthdays/Anniversaries, and more! WAvailable in ivory paper. Week-at-a-View and Month-at-a-view Formats. 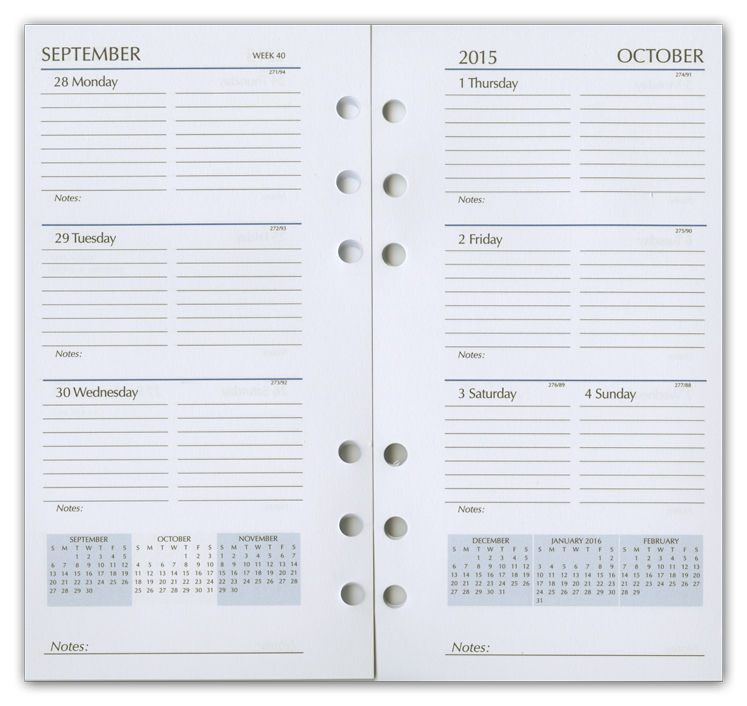 One planner, two formats in the same system. 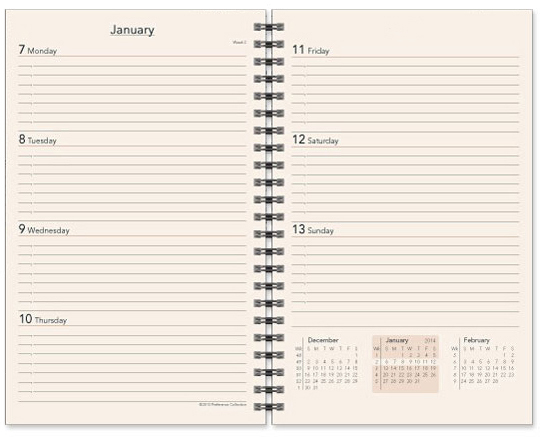 Other features include 3 Year-at-a-View, 12 Month-at-a-view, 52 Week-at-a-View, PLUS: Advance Planning, Important Dates, Weights & Measures, International Holidays, Weather, Interest Rates, Road and Air Miles, Birthdays/Anniversaries, and more! Bright white paper. 128 pages. 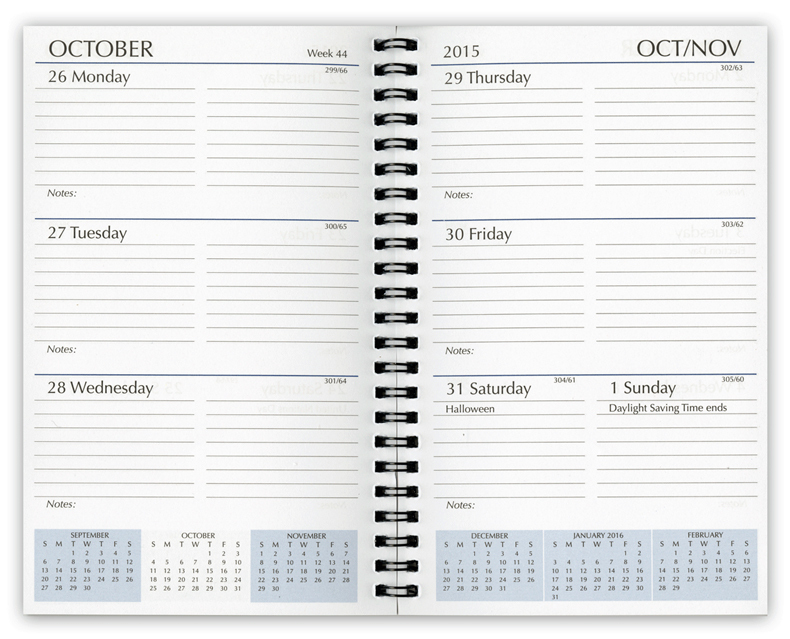 One week per two page spread, appointment times with 15 minute intervals. View weekly appointments. 52 Weeks. Includes holidays and special information pages. White paper refills. 128 pages; Weekly View Format. Also includes a 3 Yearly View, 12 Monthly View, 52 Weekly View. And includes Advance Planning, Important Dates, International Holidays, Birthdays and Anniversaries, Weights and Measures, Weather, Interest Rates, Road and Air Miles...and more! Calendar refill only. White paper refills. 128 pages; Weekly View Format (January-December). Also includes a 3 Yearly View, 12 Monthly View, 52 Weekly View. And includes Advance Planning, Important Dates, International Holidays, Birthdays and Anniversaries, Weights and Measures, Weather, Interest Rates, Road and Air Miles...and more! 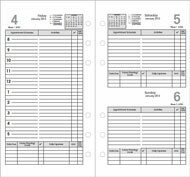 26 address sheets and 13 Division A-Z Address Tabs included. White paper refills. 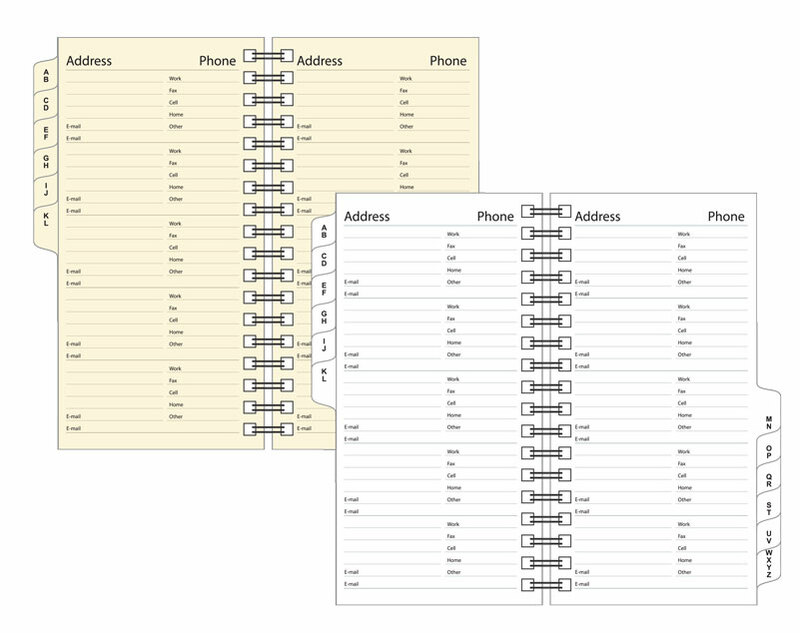 26 address sheets. 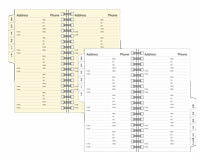 One set of 13 division address tabs included. Pack of 3, 40 white blank sheets with black tape binding and micro perforated sheets. White paper. 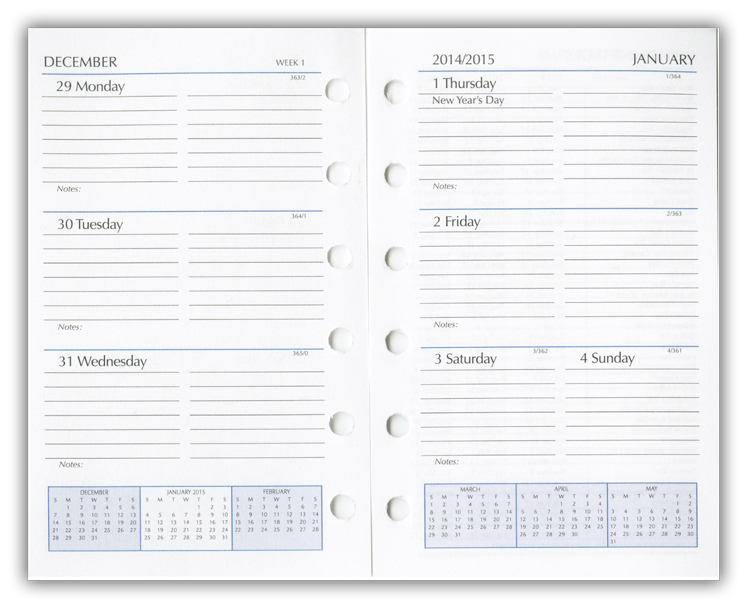 144 pages; Weekly and Monthly View Format. 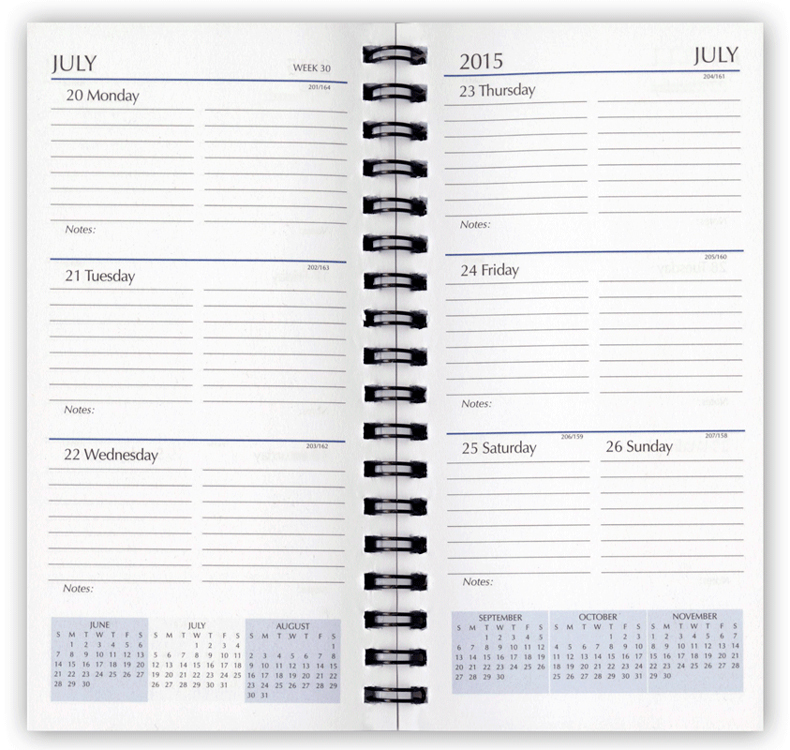 One planner; with two formats. Also includes a 3 Yearly View, 12 Monthly View, 52 Weekly View. And includes Advance Planning, Important Dates, International Holidays, Birthdays and Anniversaries, Weights and Measures, Weather, Interest Rates, Road and Air Miles...and more! 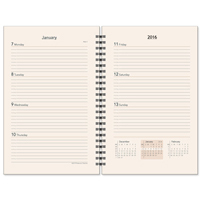 Calendar refill only. White paper. 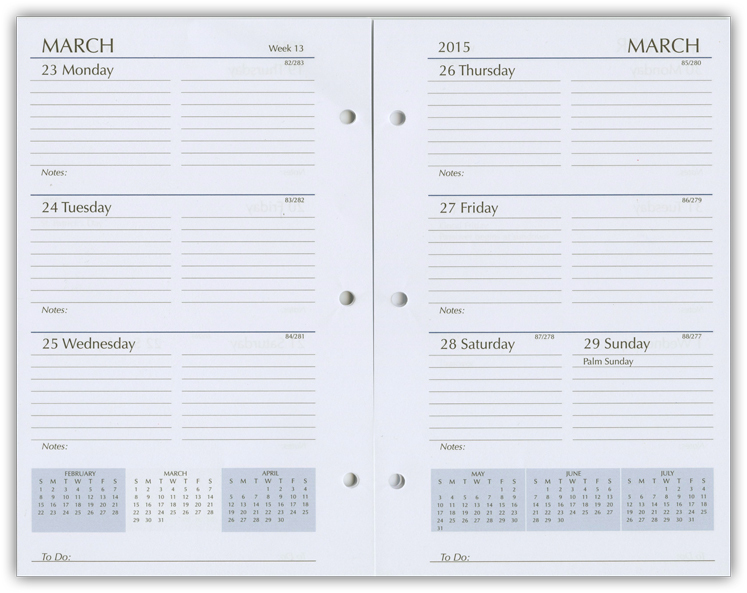 144 pages; Weekly and Monthly View Format. 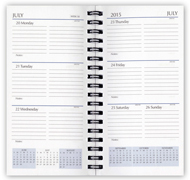 One planner; with two formats. Also includes a 3 Yearly View, 12 Monthly View, 52 Weekly View. And includes Advance Planning, Important Dates, International Holidays, Birthdays and Anniversaries, Weights and Measures, Weather, Interest Rates, Road and Air Miles...and more! 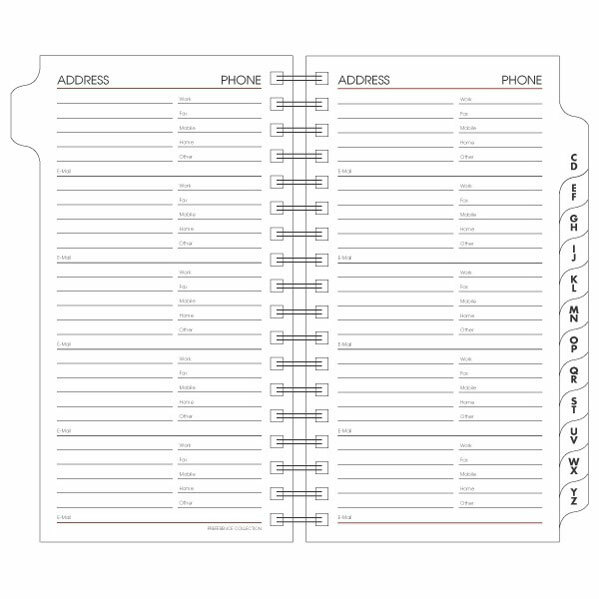 26 address sheets and 13 Division A-Z Address Tabs included. White paper. 144 pages; Weekly and Monthly View Format. 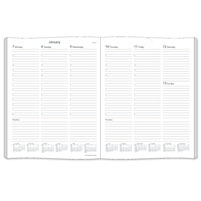 One agenda planner; two formats. Also includes a 3 Yearly View, 12 Monthly View, 52 Weekly View. And includes Advance Planning, Important Dates, International Holidays, Birthdays and Anniversaries, Weights and Measures, Weather, Interest Rates, Road and Air Miles...and more! 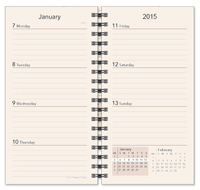 Calendar refill only. If you're calling about an existing order with SunGraphix, please e-mail sales@refillservices.com with your order information and telephone number, so that you can be contacted by SunGraphix. Wirebound construction, with a 13-step Mylar index. Size: 5" x 8". Coated wire to eliminate messy tarnish. Available in white paper. Please allow 10-14 days for delivery due to seasonal volume. Disclaimer: For all Canadian Shipments, customers are responsible for all duties & taxes upon delivery; not included in cost. 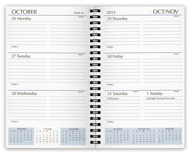 Copyright CalendarRefills.com All Rights Reserved.